Enjoy your pregnancy by having a safe and healthy one, with this pregnancy nutritional guide that takes you through every trimester. Pregnancy is one of the most demanding time of any woman’s life, nutritionally speaking. During this time, you need all the best nutrients you can get to support the growth of your developing baby. Even before you conceive, you should eat healthily for at least six months to prepare your womb, eat healthily throughout your pregnancy, and thereafter. The health of your child up to their adulthood is formed from the moment they are conceived. At each trimester as a pregnant woman, you will be faced with different sets of challenges. It is important that you eat the right food at every stage to ensure that you supply the nutrients your baby needs to develop. Know the key nutrients that you will need, not only for your baby, but also for yourself. There are many sites out there that teach you pregnancy step-by-step. I will not go into detail about the entire pregnancy cycle but will highlight here some of the foods that you should take more of, and foods to avoid. If and when you are planning to get pregnant, endeavor to eat balanced and healthy meals to supply your body with all the best of nature’s nutrients. Include plenty of fresh fruits, vegetables and whole grains into your diet. I know, this is a no-brainer. Some of the most important nutrients you will need are calcium, vitamin D, iron and folate. Your need for essential nutrients are doubled when you’re pregnant. You get most of your nutrient needs from nutrient-dense and healing foods such as fresh green leafy vegetables and fruits. While eating plenty of plant foods, there may be a deficiency in vitamins B6 and B12 which are mostly found in animal products, and you will need to eat them in large amount before you will achieve the required daily amount. An efficient and safe way to take these vitamins (in a vegetarian’s diet) is by taking chlorella, spirulina or drinking wheatgrass juice which contain very high amount of these vitamins. These nutrients not only help to greatly reduce morning sickness, but are vital to the development of your baby’s nervous system and brain. Quit alcohol and caffeine as these will significantly reduce your chances of conceiving. And be sure you keep this out of your diet and your system, months ahead when you start planning to get pregnant. During this time also, get into shape by exercising. Exercise will help lessen your hormonal swings and if you continue exercising throughout your entire pregnancy, it can also help tremendously during labor and childbirth. If you are underweight, try to achieve your ideal weight before you get pregnant, to lower the risk of pre-term or low-weight baby. Check your BMI to know if you are underweight. Congratulations! Now that you are pregnant, you are elated, and there are 1,001 things to think about. But, one of the most important things you have to bear in mind is to maintain optimal health through proper nutrition. It is a direct connection to your baby and his/her whole future. Most women have morning sickness during the first trimester. You cannot totally eliminate vomiting sometimes, but you can reduce the frequency of it. One of the ways is to snack frequently on small amounts of food. Do not allow your stomach to go hungry, and avoid motion (e.g. sitting in a car) that aggravates the nauseous feeling. Here are some suggestions of healthy snacks that you could munch on to reduce your morning sickness: apples, oranges, celery or carrot sticks, any kinds of nuts, and whole wheat crackers. Ginger tea is very helpful for calming nauseating feelings. Most mothers agree that the second trimester is the best time of pregnancy. I know I do! The morning sickness has subsided by this time, and you will feel more energetic. Fetal movements begin from about the 18th week, making you feel connected to the baby. However, you will continue to experience many new changes to your body. Continue to eat healthily and know what foods you should avoid. I list below, some of the minor problems you may encounter during this time. Listen to your instinct and be sure to check with your gynecologist if you feel that these are beyond normal. Constipation: Relief constipation by taking plenty of fruits, vegetables and fluids. Eat a diet high in fiber and exercise regularly. Heartburn: The growing fetus pressing on the stomach may increase the chances of acid reflux. Leg and foot cramps: There are several reasons why you may get leg/foot cramps during the second trimester. One of them is that you’re probably lacking in magnesium and calcium as your baby begins to draw minerals from you for its development. You can help reduce cramps with proper nutrition. Nasal congestion: Mucus membranes swell, causing nasal congestion or a stuffy nose. Drinking the right juices usually help to ease the congestion. Shortness of breath: The raging hormones may affect the blood flow and muscles in the lung, causing shortness of breath. Skin: Acne is common because the skin’s sebaceous glands increase their oil production. Hormones may also cause darkening of skin pigment which disappears after baby is born. Swollen gums: This is a painful and terribly unpleasant condition, possibly caused by the increased blood flow and hormonal changes. Reduce (table) sugar intake. The third trimester is the stage of preparation for childbirth. You would be seeing rapid fetal growth and your baby would demand more nutrients as he/she is developing fully. Pay attention to their needs and ensure that you get sufficient calcium, iron, protein and other essential vitamins and minerals. While some symptoms from the first and second trimester have passed, new symptoms would develop. You would be feeling most discomfort—lower back pain, leg cramps, swollen feet, frequent urination or uncontrolled bladder, easily tire, difficulty sleeping, and so on. When you have eaten healthily and provided all the important nutrients for your baby, much of your anxiety will also be alleviated knowing that you are building an important foundation for your baby’s well-being when you bring them into the world. Well done, mommy! Processed foods: My rule is this—processed foods that come in colorful packaging that are meant to have very long shelf lives will shorten our human lives. Avoid them especially when you are trying to get pregnant, are pregnant, or nursing your baby. They are not real food, contain high amounts of toxic sugar and salty, many food additives and preservatives that affect you and your baby in the long term. Alcohol: Alcohol passes through the placenta and prevents your baby from getting oxygen and nutrients. Heavy drinking during pregnancy will hinder or damage your child’s development. Raw eggs: Avoid raw eggs, even though you may love them. Raw eggs may carry food-poisoning salmonella bacteria. Severe diarrhea or vomiting caused by raw eggs may stress your baby and lead to preterm labor. On the other hand, cooked eggs (soft-boiled, hard-boiled and poached are best) are essential for its rich source of protein and choline. Avoid eggs during the last trimester to prevent your baby putting on too much weight, making it difficult for delivery. Raw meats/sashimi: Like raw eggs, undercooked or raw meats may carry salmonella, E.coli and other bacteria that may cause food poisoning. Severe diarrhea or vomiting may cause miscarriage or preterm labor. Cured meats: Cured or smoked meats such as ham, hot dogs, bacon, luncheon meat, sausages contain sodium nitrate and/or sodium nitrites that increases the risk of babies having brain cancer. Bitter gourd: The active constituents (alpha and beta monorcharins) in bittergourd/melon is not suitable for pregnant women’s consumption as it may stimulate the uterus. Fish with mercury: Swordfish have been found to contain the highest level of mercury among all edible fish. Mercury is a potent human neurotoxin that can significantly damage the fetal nervous system. Other fish in this group to avoid are mackerel, shark, trout, tilefish, and certain tuna. Saffron: Saffron is generally a safe spice, but when taken in excessive amount can be toxic or even deadly, causing hemorrhages. Avoid saffron during pregnancy and when nursing. Read also the Women’s Sexual Health page for extra tips on staying healthy as a woman. Note: Diabetic mothers should take less fruits and more vegetables. Spinach and asparagus are excellent sources of antioxidants, flavonoids, iron, and folate. Asparagus helps increase the glutathione level that is crucial in the development of the fetus. Kale and broccoli (or cauliflower) provide outstanding amount of calcium that is important for a pregnant woman who needs plenty calcium for herself and her baby’s development. Include celery for its organic sodium and minerals that hydrates the body cells and have an immense amount of health benefits, also for bone building. Fruits/vegetables that are red-orange colored contain higher amounts of vitamin C, beta-carotene (pro-vitamin A), antioxidants, and lycopene that may help reduce the risk of preeclampsia. Beetroot, capsicum and papaya are rich in calcium, potassium, iron, copper, and many of the nutrients necessary for a healthy pregnancy. 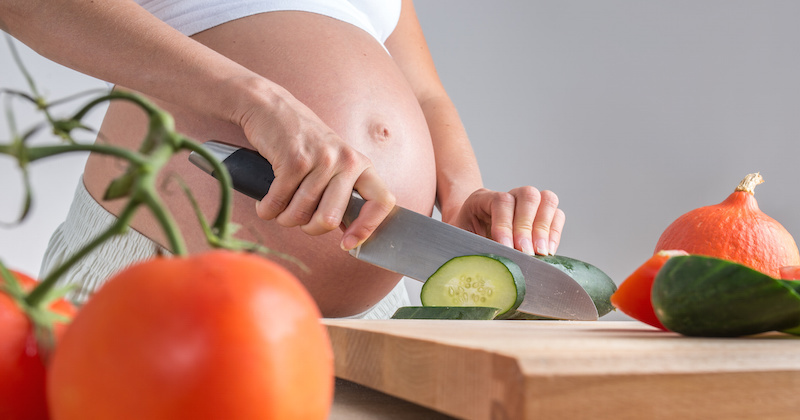 Eating papaya regularly not only provides your body with so many nutrients, it is also beneficial for regular and complete bowel movements that is so necessary throughout your entire pregnancy. Avocado provides a high amount of folate that is necessary for the neural development of the fetus. One avocado a day is not too much. Include lots of fruits and vegetables into your daily diet to give your baby a strong health start to life. Basically, eat “clean”. Attractive section of content I just stumbled upon your blog and I actually enjoyed it.